Welcome back to Rotten Ink. 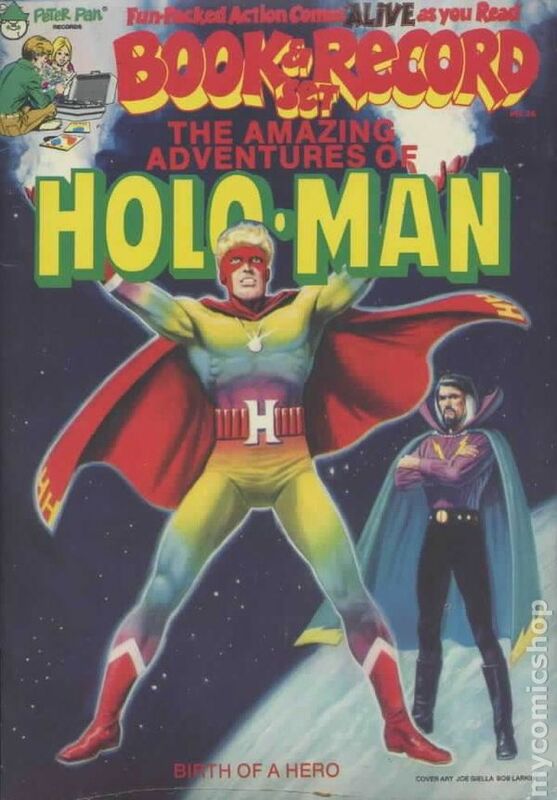 On this update, I want to take a look at a superhero who never quite made it to the big leagues and never become a household name alongside Superman, Captain America and Batman, a hero who had the power of holograms as well as some other science fiction style abilities…and that hero I am talking about is Holo-Man! Yeah, I know a small portion of you readers out there know about this hero, but I am sure an even larger portion are in the dark to who this bright rainbow colored hero is. So let’s start with the basics including how I first learned about Holo-Man and his greatness. Near our house on Royston Drive in Waynesville Ohio was Mary L. Cook Public Library, a place that my family visited quite a bit to check out books and comics and rent VHS tapes, all great stuff that helped add to the enjoyment of growing up in a small village. This library is also where I discovered the Crestwood Monster Book series and is also where I would use the copy machine to make copies of pictures of monsters from books like Godzilla, Frankenstein And The Monster From Hell and The Wolf Man that they stocked on their shelves. They also had a small selection in the kids section of old Book and Record comic books that were bound in a green hardback binding and all were missing the record. I spent many of hours in that library looking at kids books, horror history books, comics and Rolling Stones Magazine, and it was a big part of my childhood for sure. I can even remember them having amazing book sales where they would sell bags of books for as low as a dollar a bag. My Mom would take me and Bryan down there on these sales and we would load up with all types of good reads. So here is to all the libraries in the world that have helped shape many young minds and helped many in the world with good reads and a place to find peace and education. And at this library is were I first laid my eyes on and even read the first and only issue of Holo-Man as I checked it out to read. I can remember the first time I flipped through the book and saw the lack of action I knew I was in for some boring stuff and I was right! The young Matt just didn’t like Holo-Man all that much, and after this first reading he became a joke of a character between my brother Bryan and I. At one point I think we made a beat and the loser had to check out the comic again and read it if they lost! 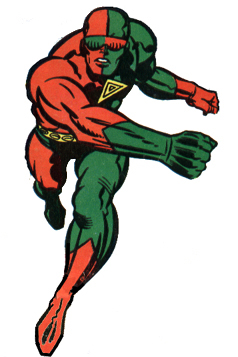 And for some reason as a kid I thought Marvel Comics made this character, and it was not until much latter that I discovered that it was Atomic Comics and this cheesy hero was a big flop with kids and readers. So I guess I should also say thank you Mary L. Cook Libary for also introducing me to Holo-Man and his lackluster adventure. 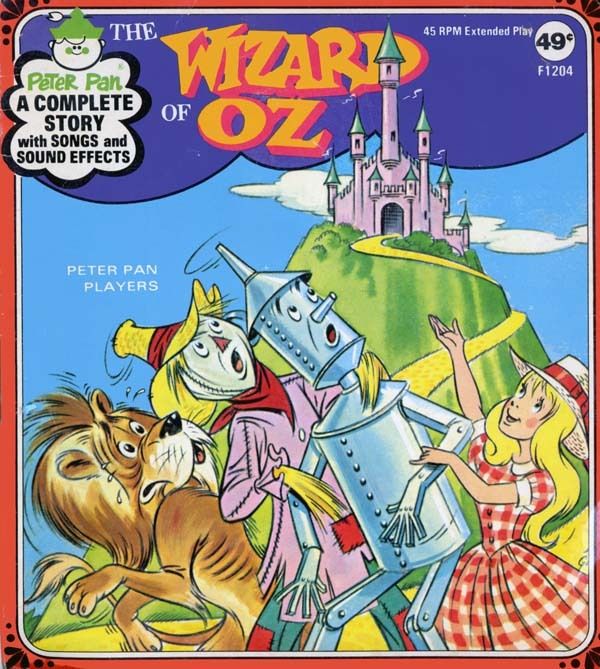 Back in the 70’s, Peter Pan Records created a branch called Power Records that was a way to showcase record-based dramas featuring comic book heroes as well as TV and movie characters. Besides doing large LPs, they also started to do small 45 ones that were packaged along with a comic book and were called “Book And Record Set.” They would be a great way for comic fans to get a little more bang for their buck as they cost more than a regular comic. Power Records didn’t pick sides in the comic war as they put out just as many DC as they did Marvel and sometimes they would even put out an independent title like they did with Holo-Man. 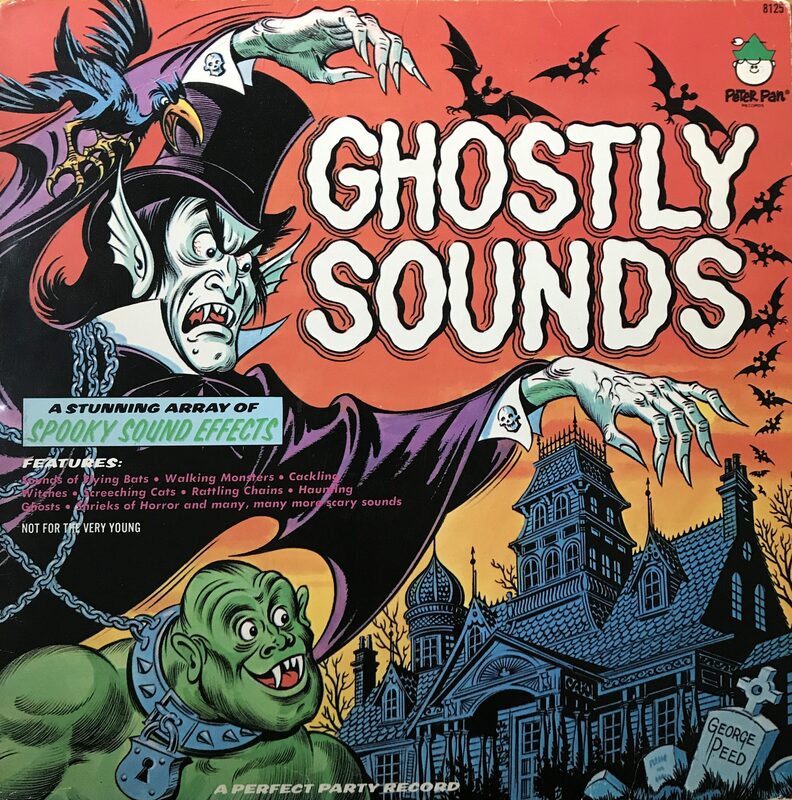 Besides normal LPs and the Book & Record sets, they also did story books with records that were mostly based around movies of the time like Star Trek The Motion Picture. Growing up, my brother and I had lots of these style books and most of the time, the poor record would get lost or scratched and we mostly just used them as normal books! 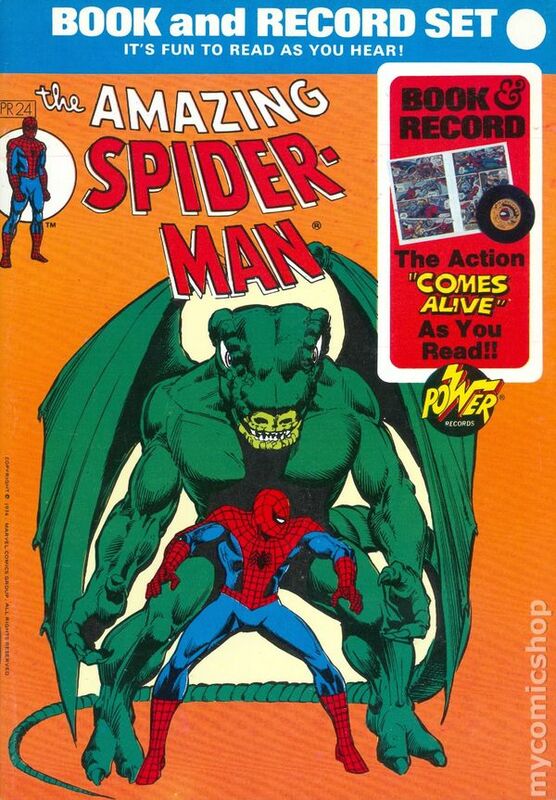 But while this style of comic isn’t not made anymore, those who had them growing up know how cool it was to read your comic/book and have a record playing the adventure you were reading acted out as a play. 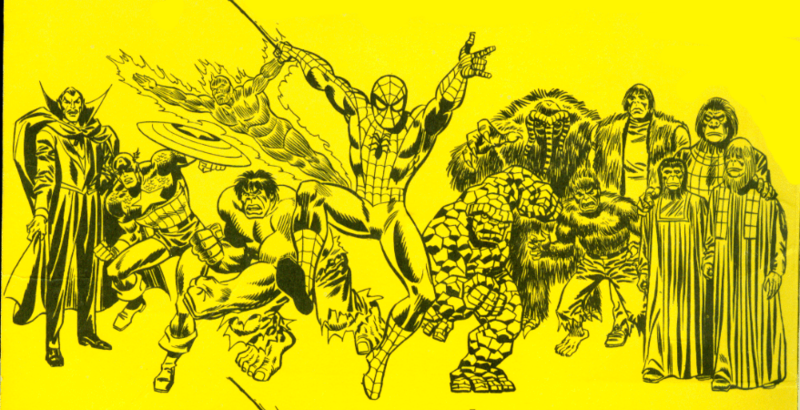 Back when I use to rent the Book & Record comics from the library, the back inside cover use to be this really cool yellow background picture that showcases many of Marvel’s top heroes as well as monsters and movie tie-in characters that included Captain America, Hulk, Man-Thing, Dracula and Apes from Planet of The Apes. I can admit this now as I ended up buying these very books from a library sale when I was a youngster, I used to try and peel off those pictures as I wanted to keep them and tape them to my cardboard playhouse I had in my room. For some reason I really wanted Jack Russell aka Werewolf by Night as I was a huge fan of werewolves in films and comics. It was something about the black pen drawings on that yellow background that made my young mind also work into over time to set up fake fights between the characters and make up stories of how Dracula would be defeated by The Hulk or how The Thing would survive on the Planet of the Apes. I had such a great imagination when I was a kid. I am sure you’re wondering if I was ever able to peel any of them off and tape them up, and the answer is no as the picture was glued to the back of the hardback book binding and when trying to peel they would just rip and you would end up with half a character or a headless one. 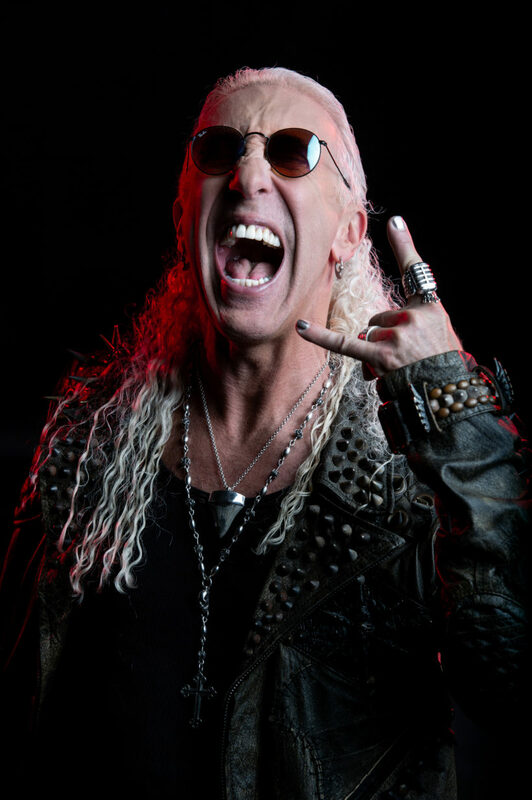 Below is a picture of that image and to this day for some reason I think it’s badass! 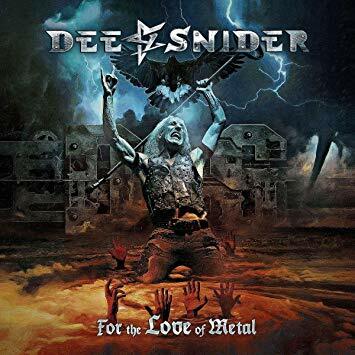 While I am a old school metalhead who loves to listen to music that makes me want to bang my head and allow metal health to drive me mad, I still enjoy a good pop release that is filled with catchy songs and fun loving beats. One of the modern pop rap divas that I have found myself enjoying is Iggy Azalea, who is a beautiful young woman from Australia who has a soothing voice as she raps, well at least that’s my opinion. I first heard of her thanks to Youtube as I saw her video for a song called Fancy where she dressed up as Alicia Silverstone from the film Clueless. The song was catchy, and her appearance caught my attention and lead me to watch more of her videos as well as listen to interviews she did. Then I noticed that she was being played on the radio more and more often as well as guest starring on many other rap and pop songs for other artists. So while I was working on this write up for Holo-Man, I was re-listening to Iggy and decided to share my thoughts on her first E.P. “Your Life” as well as her first full release called “The New Classics.” So sit back and let me tell you about the hit and misses of these releases. 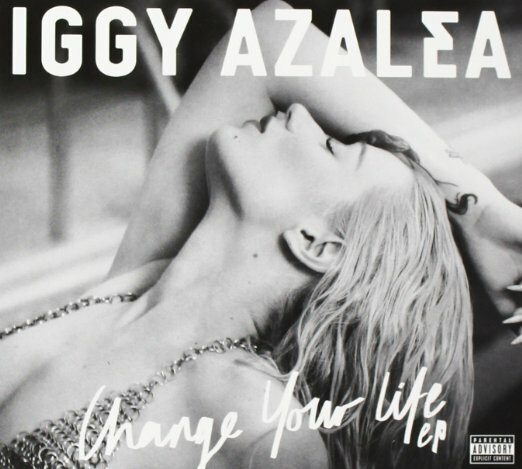 In 2013, Iggy put out a E.P. to showcase her talents and build up a fanbase before her first album dropped. This E.P. was called Your Life, and it only really has 3 songs with the rest being remixes. This is kind of annoying but I can forgive it with it being only a E.P. my favorite song on this hands down is “Bounce,” a really catchy song that mixes pop rap with Bollywood beats. This truly is a good song and was even used for the trailer for Spy starring Melissa McCarthy. The rest of the songs on the E.P. are okay but most are just remixes of the same song. 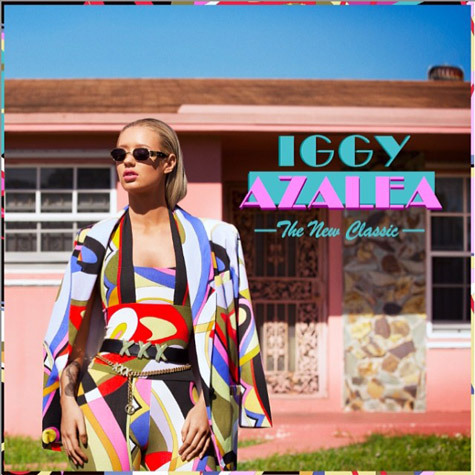 Iggy Azalea’s first full album was the 2014 release called The New Classic, and it’s a perfect mix of rap and pop music that is filled with lots of catchy songs as well as some really silly and cheesy ones. Some of my favorite songs off this album are Fancy, a pop rap treat for the ears that has her teaming with Charli XCX that has catchy beat and some fun lyrics. My other favorite is her other radio hit Black Widow where she and Rita Ora sing about making their one time lovers hate them. But just wanted to share real quick what I was listening to when I wrote this update, and I am not afraid to say I am a Iggy fan and look forward to her next release. Who is Holo-Man and what is he about I am sure your thinking to yourself, and some of my readers who have read comics most of their lives are trying to remember if they ever seen an issue of Holo-Man in their local comic shop or even on a spinner rack at the grocery store. And to answer the question, Holo-Man was only made in the Book & Record set as far as this nerd knows. But one puzzling aspect is that Holo-Man had his own fan club as well as was on a coin that was featured alongside Marvel characters who also had coins made! So it makes you wonder if Atomic Comics who created Holo-Man and Marvel had some sort of partnership where crossovers or even help distribute his comic series. Holo-Man had a huge push with merchandise, a fan club, a book & record set and the coin, so what went wrong and why was only one issue made? Did the comic sell that badly that no other issues were ordered? Did Atomic Comics go out of business and the character fell into a fate of no company to call his own? 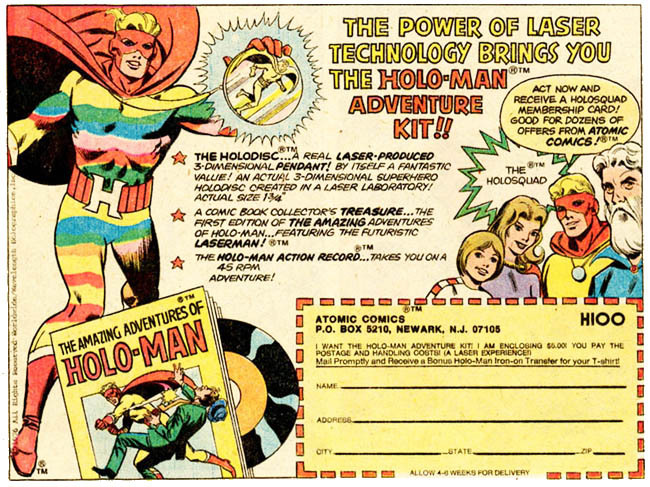 Whatever the reason that Holo-Man was not a top notch hero in the world of comics one thing was for sure is that for $5.00 you could become a HoloSquad Member! So you know as much about Holo-Man as I do, and you learned about my introduction to this Z-Grade tight wearing hero. But even if he is a cheesy hero and his comic only lasted one issue and had to be packaged with a record, he’s still made his mark in the world of comics no matter how small the impact was. 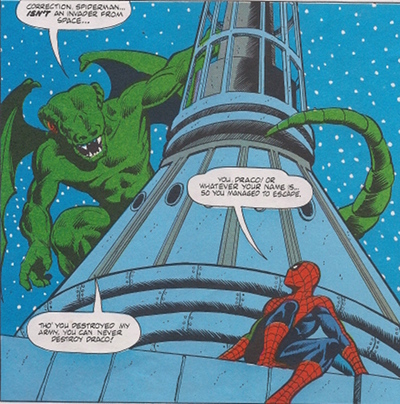 Plus you know that Atomic Comics must have had so much faith in the character and they were hoping that readers and kids would bond with the character and make him a household name like Superman and Spider-Man. I should also think Ebay for having this comic for me to review for this pre-thanksgiving update snack that is backed with enough comic sci-fi cheese that it should keep us stuffed till then. I want to remind you that I grading this comic on a standard 1-4 star rating and base it on how well the comic stays to the source material, its entertainment value and its art and story. So if you’re ready to relive this comic adventure with me and see just how well Holo-Man holds up (or is that degrades?) let’s turn on a lava lamp and travel to the world of holograms. A pair of Syrian spies break into a top secret lab in Texas and rig up a laser to explode when it’s next fired up. They do so because The President of the United Sates is at the lab and is about to watch a laser/holographic fusion demonstration put on by Dr. James Robinson and his assistant Hugo, and they hope they all will be killed in the explosion! As the test starts and the laser overloads, James jumps in front of the President and saves him but takes a blast of Holographic rays. This takes James to a portal in the galaxy and he meets Laserman who fills him in on his new powers of becoming the first ever living Hologram known as Holo-Man! 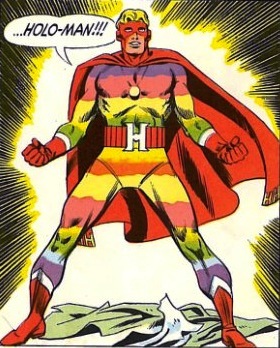 As Holo-Man he can travel through time and dimensions, can blend in with his surroundings and can make illusions to confuse his enemies, but he must charge a charm every 12 hours or his powers become weaker. James wakes back up in the lab and finds Hugo dying who tells him that the accident was caused by the Syrians and he was the one that gave them the blueprints because they were holding his family hostage. He also tells James that the Syrians are going to use holographic missiles to confuse the American people and then set out a real attack to take over our great nation. Hugo dies as Holo-Man rushes to the White House and tells The President about the Syrians plan, and they decide that they must stop it before it happens. When Holo-Man leaves, his power is weaker and he must charge his disc but as he looks up the fake missiles are already filling the sky as panic people are running for their lives. This comic ends on a cliffhanger with fake missiles in the skies as poor normal people are panicking and Holo-Man is standing around looking shocked at what he sees even though he knew the attack was in the works and that the first wave of missiles are fake. This issue is clearly an origin issue with the idea of making comic readers become attached to the hero. It’s plot is very simple, foreign bad guys try to kill our President, a scientist who is not only super smart but brave takes the brunt of said accident and turns into a superhero who in turn must stop the bad guys from invading America. The major issue is that Holo-Man/James Robinson is not fleshed out enough for me to really stand behind him and allow him to become a hero that I would care about reading more adventures of. What I did gather about Holo-Man is that he is smart and loyal to America and while he has powers that allow him to create holographic illusions and travel in time, he does not have any type of super human strength so a well trained thug with fists of stone could knock him out with a well placed punch. 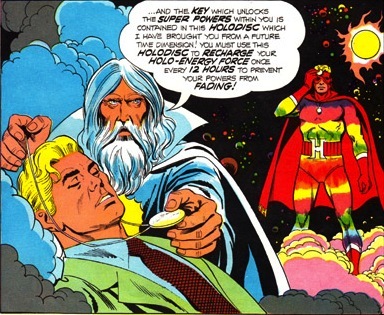 Another downside to Holo-Man is the fact his powers can be drained if used too long and he must spend time to charge his HoloDisc that he must keep safe. While I understand his family was in danger, Hugo still is a traitor to is country and single handedly has helped turn America into an upcoming warzone. Laserman is a mix of Zeus and a Wizard and rocks a white long beard and just flings powers on James and gives him one of the quickest crash courses ever on what his powers are. 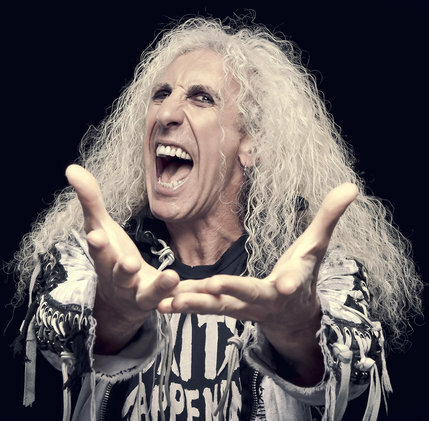 I would say he would have to be one of the worst mentors in comic history. The President looks a lot like Jimmy Carter who would have been the President at the time of the comic and records release. While I read the comic first by itself I later did listen to the record to help add to the over all cheese and fun of this comic. I must say that this comic is slightly better then I remember it being as a kid, but with that said it still is a bland yet entertaining comic. Shame on Power Records and the creators of Holo-Man for not finishing this story as the end makes it appear that all hope is gone and that America is going to become like Red Dawn with Syrians instead of Russians taking over. The art work is done by Joseph Giella and has that classic 70’s comic look, and is well done for what is really a throw away comic. 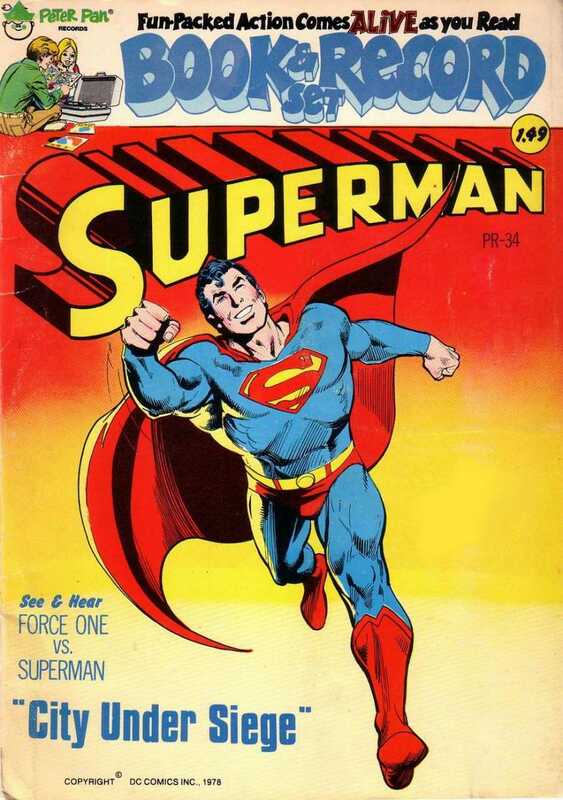 Over all this is as cheesy as I remember it being and for all accounts is a superhero that time has truly forgotten. Reading back to back comics about superheroes that have cheesy outdated powers and even goofer costumes gave me the idea to have a fantasy warfare that will pit 3-D Man against Holo-Man in a battle of might and power. The setting will be downtown Belmont, Ohio during a Thanksgiving Day Parade right outside Rich’s Pawn Shop in the year of 1983. 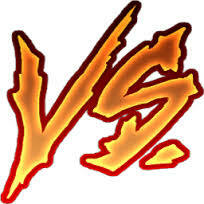 So let’s sit back and see who will win this showdown of epic proportions as 3-D Man vs. Holo-Man! 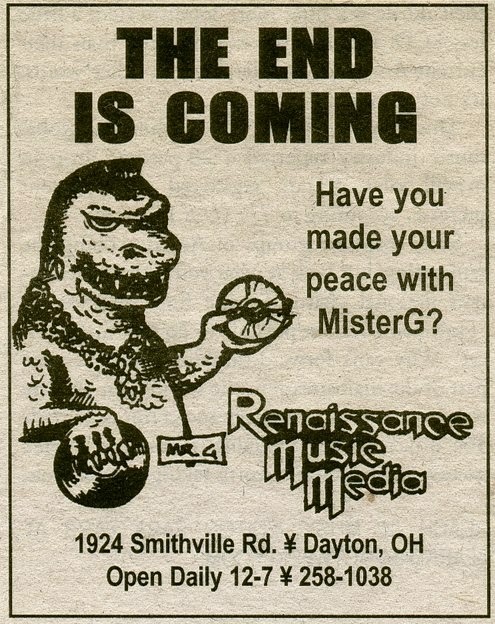 A float for Renaissance Music is going down the street as the Godzilla masked Mr. G is waving at the people watching the big parade as its followed by a Mike-Sells float that is throwing out potato chips the the hungry crowd. One couple watching is Hal Chandler and his wife Peggy who wave back and as they do so Hal notices that near Ritch’s Pawn Shop a man in a trench coat is looming around looking as if he is a man on a mission! Hal fears that this man might be a pervert flasher and fearing that his wife might be his target he slips away and puts on his special glasses and transforms into 3-D Man. As the red and green hero rushes off the knocked out body of Hal hits the near by dumpster and looks like a drunken fool who couldn’t handle his liquor. As 3-D Man rushes to the trench coat menace he grabs him by the shoulder and off comes the coat to show before him a man in rainbow colors and a red cape! The man turns around and screams “Who dares put their hands on Holo-Man, the master of holograms as he tries to enjoy this parade?” as 3-D Man says “ I do as I am 3-D Man the master of 3-D, and you my friend is no watcher but a flasher!” These words send Holo-Man into a rage as he is really there to watch and not show off his goods, and he places a powerful hit onto 3-D Man’s jaw knocking him through the window of Belmont Catering. A crowd starts to gather as people watch as 3-D Man leaps from the window filled with anger and knocks Holo-Man to the ground and starts pounding on the his face. Holo-Man after a minute of having his face smashed is able to kick 3-D Man off him with the power of a mac truck and knocks him across the street, and stands to his feet his face bloody and swollen he looks at 3-D Man who is back to his feet holding his ribs. Holo-Man knows that this is his chance as he bull rushes his opponent and starts landing punches to 3-D Man’s body like Rocky hitting a slab of meat, the punches are powerful and you can hear ribs cracking and breaking. 3-D Man falls to his knees as Holo-Man turns to the crowd to let the crowd know that the fight is over, but he should never had turned his back to 3-D Man who uses all his power to place a punch to the back of Holo-Mans head and through it as his fists exits the master of hologram’s mouth killing him on the spot. The crowd screams in horror and runs away as the police are nowhere to be found. This buys 3-D Man some time as he crawls to Hal and enters awakens his brother only for Hal to wake up and find that his wallet, watch and shoes have been stolen and his wife had ran off with a young scientist form Dayton named Bruce Banner.